…I’ve decided to apply to become a corps member for Teach for America! 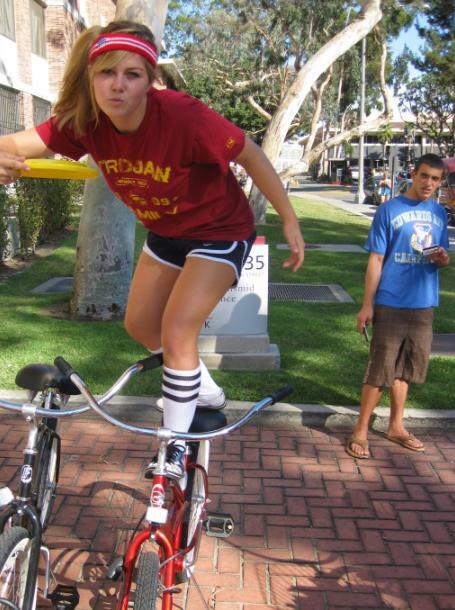 I’ll know by November 1st whether I’ve gotten the job or not, but I’m really crossing my fingers and doing good things to random people who annoy me in hopes of boosting my karma points (I’m sorry for cutting you off with my skateboard, entire USC campus!). I’ve researched and interviewed just about everyone I can think of in order to find out everything about Teach for America. It seems like the people who know most about the organization tend tend to feel passionately on both sides of the spectrum — some believe it does more harm than good, others believe it’s truly creating progress. The main criticism that’s been given to me is that a lot of people who apply to be a corps member are doing it for the wrong reasons — they solely want the service work to help them advance in their future careers without actually feeling passionate about children. The corps members take the place of teachers without jobs who are technically more qualified. However, recent studies show that this is not necessarily the case in California. This criticism does not apply to me. The main reason I want to join the organization is because I miss the little pipsqueaks that I’ve cared for over the past three years. All of my close friends could probably name about five kids I’ve worked with — and I know they get tired of hearing about the funny/interesting things that happen at camp (which to be honest is part of why I’ve created this blog! I can tell as many camp stories as I want and have my enslaved computer an attentive audience). I’ve mentioned before in the past that I can’t see myself in a career that doesn’t involve working with children, and that’s why going into law right away is not the best decision for me. I know it will be challenging, but I also know that it will be a rewarding adventure! This entry was posted in children, College, Lifestyle and tagged children, controversy, Corps member, law school, Teach for America, TFA on September 13, 2012 by chantae. Sadly, it is my last semester at USC because I’m graduating one semester early. I awkwardly have already walked because they don’t offer a December ceremony and I plan on being lost and stumbling around in a foreign country come summer 2013. 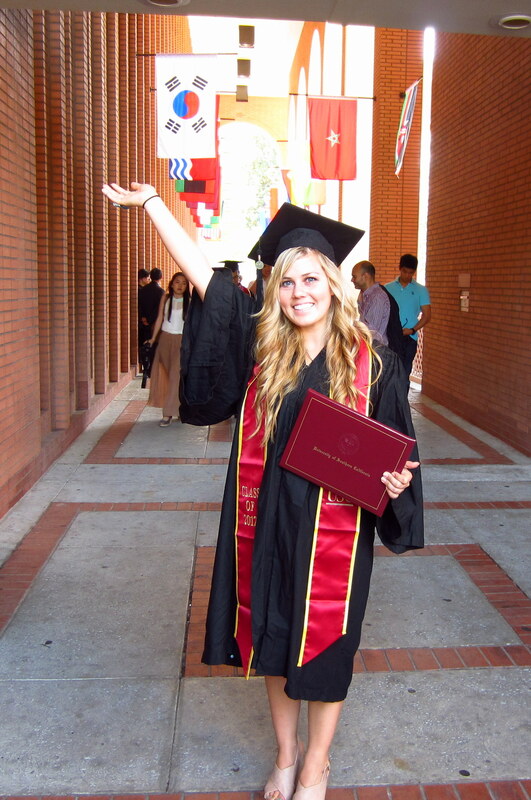 It’s kinda scary though — USC will let anyone walk as long as you have a gown. They don’t even check to make sure you’re a student. After learning this fact, I was suspicious of about 10% of the people who walked across the stage for the class of 2012. Especially the bearded man who forgot to wear pants under his gown. It’s not a complete fluke though because technically I’ve already completed my political science degree. After: A “polished almost-graduate” whose brain cells have been parasitically killed off by the classrooms in the building behind me. In many ways it feels like I’ve come a long way since my freshman self — except for the fact that I still have no idea how to cook. I’ve been eating the same five items of food for the past two years. My freshman year I had a meal plan and feel nauseous looking back at the amount of cereal/homemade “salad chili” I used to shove in my face, and vaguely remember using just my bare hands once to do so. I took refried beans from the Mexican section of the cafeteria, and put random vegetables in it from the salad bar. I think beets were involved at some point. 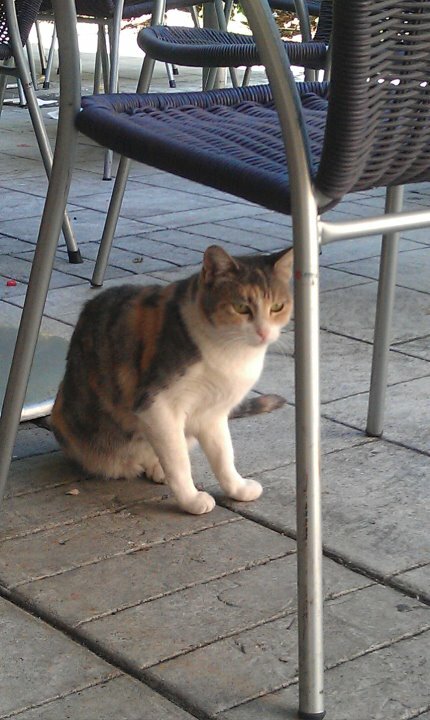 The leftovers were given to the cafeteria feral cat, who you can find on facebook here. EVKitty protected my meal from the pigeons, who would often encroach on my feasting territory while fighting each other over the occasional left behind chicken nugget (cannibals!). Give me the beans and nobody gets clawed. 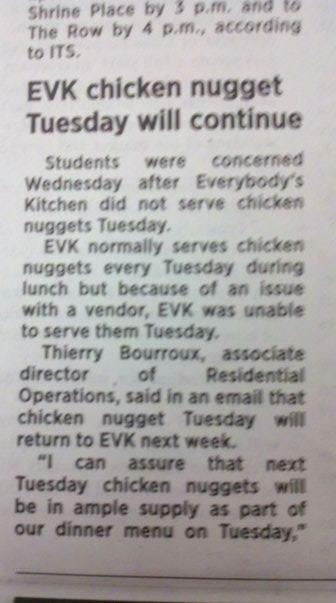 This was legitimately in the school paper. The cannibal pigeons were pleased. Advanced legal writing II. I’ve already taken the first one and masochistically applied for the second. Thankfully, I was accepted. There was probably a glitch in the system, or perhaps my professor is just as equally masochistic for accepting me back into his presence. Apparently we get to go to San Francisco to see the CA Supreme Court in action — I’m beyond excited for this. 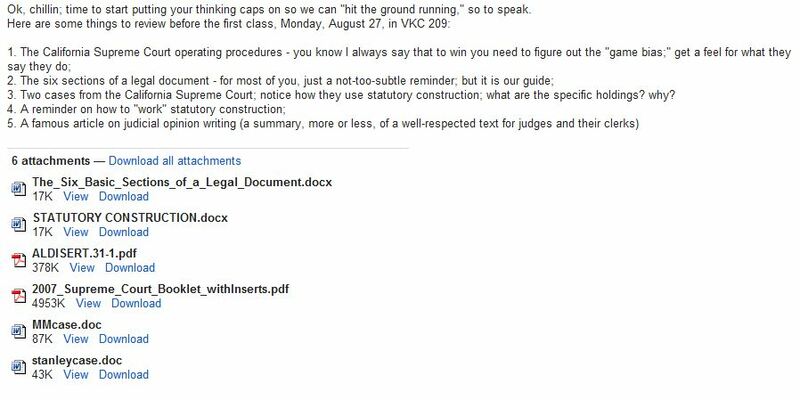 Email sent by my professor two days before class started… Only a little reading to do. Improvisational comedy. A class that will turn my life into less of a chaotic tragedy. Public speaking. 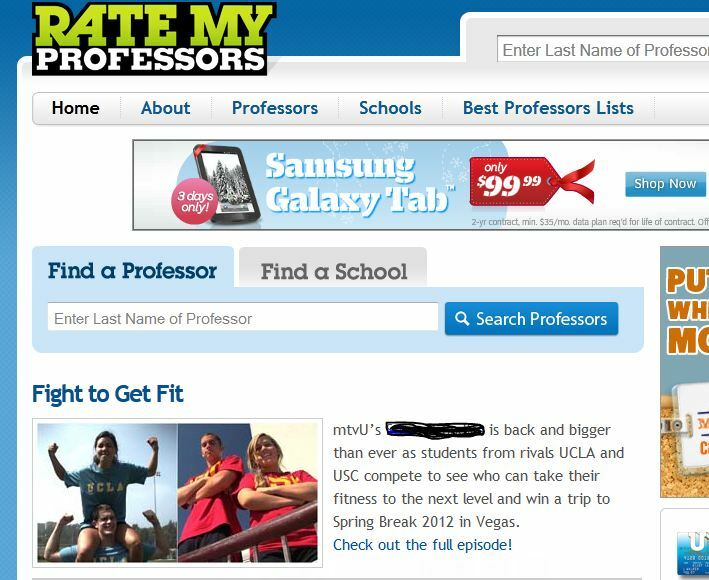 According to RateMyProfessors, (Embarrassingly, I was actually on an advertisement for the reality show I took place in for a little while) the professor means serious business and it’s pretty hard to get a decent grade. Apparently, you learn a lot in this course despite this! I have a tendency to go on tangents so perhaps my rogue thoughts will be tamed into coherent sentences by the end of the semester but I’m not getting my hopes up — you know what they say about old dogs and tricks. I’m just crossing my fingers that people don’t verbally point out how red I am at the end of my speeches — YES, I’m aware that I look like John Candy after he’s run a marathon. Leave me alone! Psychology of marriage and the family. Divorce is sort of trendy in my family — or as my high school ex-boyfriend’s mother used to say, I “come from a broken home.” But hey, what’s a little fun without the dysfunction? Call me a rebel but I want to only get married once in my lifetime. I enrolled in this course because what better way to learn about successful relationships than in a classroom setting filled with college kids?! Downside: I don’t see this as a course where smart, funny, and attractive male students (potential suitors) will be. Please let me be wrong! I need all the help I can get for our marriage to succeed. 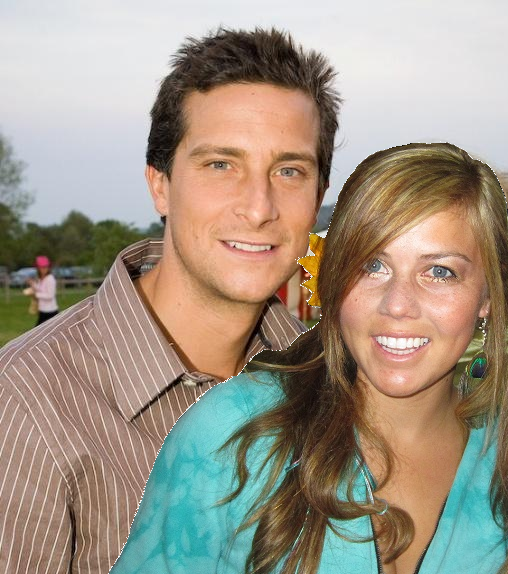 Mr. & Mrs. Grylls. Criminal behavior. I’d tell you why I’m taking this course but then I’d have to kill you. Will my courses be everything I dreamed of and more?! Will I get lost as a senior going to class? Will a freshman on Trojan meal plan offer me some dining dollars for a coffee? The adventures continue! 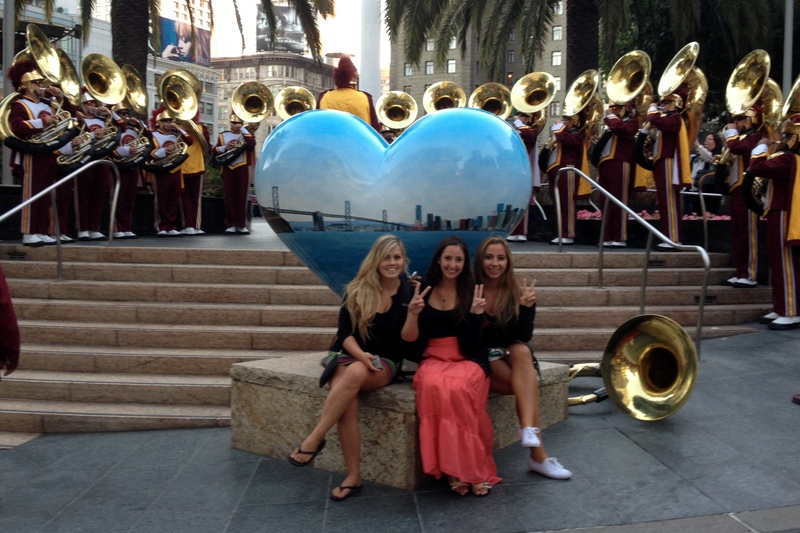 This entry was posted in College, Lifestyle and tagged Classes, EVK, political science, psychology, School, Student, Trojans, University of Southern California, usc on August 27, 2012 by chantae.